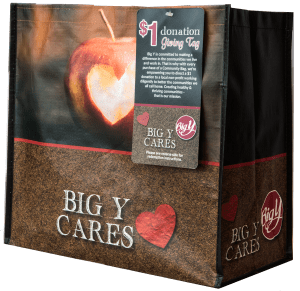 If you would like to submit a non-profit for consideration in the Big Y Community Bag or Giving Tag Program, please review the guidelines and instructions below. A direct local connection to a specific Big Y store. The commitment to put funds to use within the local Big Y store’s community. Non-profits that are clearly focused in their stated mission to impact hunger relief, education (all aspects), health & wellness, civic, or military/veterans organizations. Non-profits must be passionate in their desire to connect to the local community.